This interesting plant was first studied by the Russians many years ago. 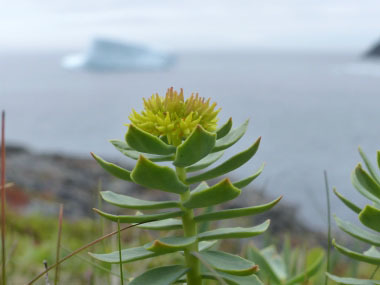 Roseroot is the second North American plant after ginseng to be recognized as an adaptogen, an herb with the ability to restore the body and mind after physical and mental exertion and stress. 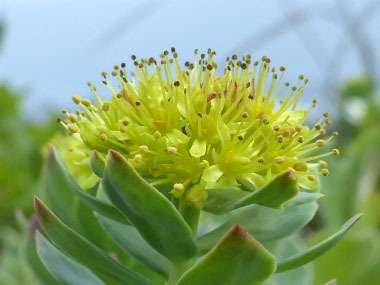 Also known as Golden Root, Aaron’s Rod, Stonecrop, Rose-root, Rose Root or Arctic Root, this perennial is in the stonecrop family (Crassulaceae). Its rose-scented roots contain unique compounds that are thought to account for the adaptogenic properties. Research also shows the roots improve learning and memory, and acts as a tonic. This plant is also cultivated. 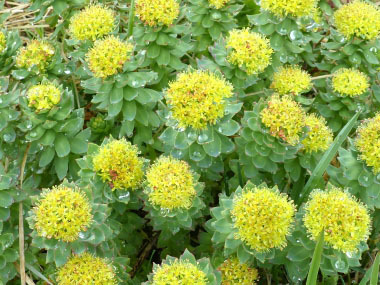 Distinguishing Features: Roseroot is a typical stonecrop plant, with a sturdy stem, succulent leaves and a waxy covering to reduce evaporation. This plant is easy to spot as it is somewhat tall and it is a succulent. The flowers are yellowish and can have reddish tips. Flowers: Roseroot flowers are usually dioecious. The corolla is regular, yellow, and measures about 0.5 to 1 cm (0.2–0.4”) broad. There are four petals measuring about approx. 3.5 mm (0.14”) long on staminate flowers, 2.5 mm (0.1”) long on pistillate flowers. The calyx is fused, 4-lobed, lobes 2.5 mm (0.1”) long, yellow. It is a staminate flower with eight stamens. Inflorescence is a dense, hemispherical cyme. Roseroot flowers bloom from July to August. 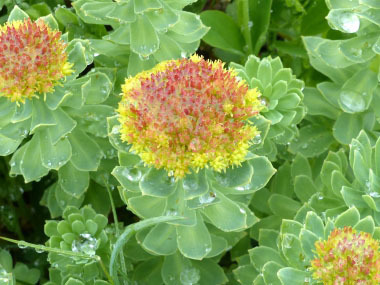 Fields of Nutrition has medicinal benefits and vitamin/mineral content of Roseroot. Leaves: Leaves are alternate and stalkless. Lowest leaves can be scale-like. Stem leaf blade elliptic–obovate, sharp-tipped, blunt-toothed, flat, glabrous, slightly fleshy, bluish. 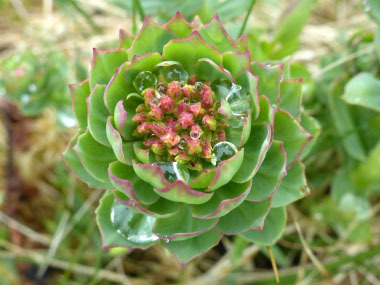 Height: Roseroot grow to 40 cm (15”) tall. The stem is erect. 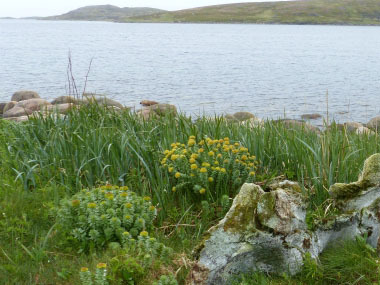 Habitat: Roseroot is typically found in crevices of mountain rocks and on sea cliffs. It also grows along stream banks, snow-bed sites, rock shelves, and is an ornamental. It favours growing in the Arctic and coastal regions of North America, regions of Asia, and Europe including the UK. Edible parts: Young succulent leaves and shoots are eaten raw or cooked. They have a slightly bitter taste. Roseroot leaves can be made into a sauerkraut. Stems can be steamed (or cooked) like asparagus. Root can be used raw or cooked.